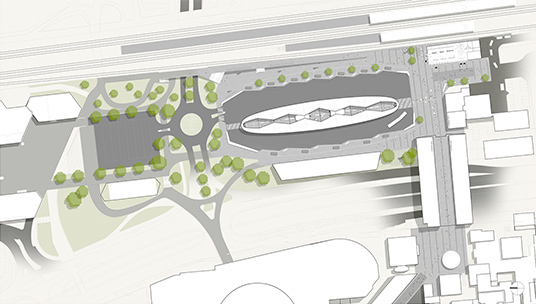 DKFS unveils their proposal for the new Busstation roof in Leverkusen. The 125m long and 28m wide roof has a reflecting stainless skin and carved in dedicated spaces which serve as boarding gates. It is the keystone in the regeneration of the new railway station quarter in central Leverkusen and promotes the city as a modern and attractive place to live and work. Dirk Krolikowski and Falko Schmitt founded DKFS Architects to share their common and genuine interest in 'architectural structures' with an interdisciplinary approach to design. In the recent years we have built an international reputation and received attention for our fresh and innovative interpretation of modern infrastructure with a portfolio of award winning bridge proposals and large span roofs. DKFS aims to develop existing models of contemporary architecture further and create value through an intensive dialogue based process. This involves interdisciplinary investigation, working in close collaboration with engineers and other experts internationally. For this we maintain close working relationships with key players in the industry. DKFS also maintains close ties to academic environment and lecture internationally about their work. They teach their own design classes at reputed Universities such as the Bartlett in London and use the research environment as a think tank to develop their fresh and innovative approach to design. Part of DKFS’ portfolio are many 1st Prize competition wins, among them the RIBA administered international competition for the River Douglas Bridge in Preston and the connecting link bridge in the historic centre of Vienna. In 2017 alone two DKFS bridge projects are reaching completion: The Museum Bridge by Dortmund in Germany and The EYE Bridge in Linz, Austria, both first prizes in international competitions.